Sunshine, blue waters and long summer days turn Switzerland into a swimmers paradise. Schedules are forgotten, the Badi bag is packed up full of pool toys, and everyone is just ready to chill. WHERE IS YOUR FAVOURITE BADI? We love Strandbad Lido Unterägeri (Address: Lidostrasse 113, Unteraegeri 6314). OPENING HOURS AND ENTRY PRICE? It is open mid-May to mid-September, 09:00-20:00. Under 5s are free, age 5-16 are CHF 2.50 and adults are CHF 5.00 for entry. A season ticket for adults with unlimited entry is CHF 55 – for children it’s CHF 18. THE BEST WAY TO GET THERE? Many locals walk or cycle (there are plenty of cycle stands), but for anyone traveling from a distance, the car is your best bet. There are a small number of free parking spaces right by the badi entrance but unless you’re really early (or it’s raining! ), you’re likely to be parking on the grass right outside the Badi entrance. On public transport, you can get the number 1 bus towards Oberägeri from Zug station and get off at Seefeld. The badi is an 11 minute walk from there. WHAT SETS YOUR BADI APART FROM THE REST? The views of Ägerisee and the Alps are stunning. Our children are of different ages, and the little ones love the sand pit, water sprinkler and fantastic playground overlooking the lake. There is a barrier keeping the weaker swimmers in at their depth. The older ones like to swim out to the nearby water slide, trampoline and diving board. Many local residents keep kayaks and paddle boards there. There is also a generously sized café, changing rooms with lockers, table tennis and volleyball. ANYTHING YUMMY THAT WE MUST TRY ON THE MENU? There always seems to be an array of delicious looking cakes and pastries. The children’s menu is well-proportioned and displays a pleasingly dark sense of humour – fish fingers and chips are called the “Nemo Menu” – poor Nemo! For adults there’s a variety of usual Swiss-German fare (schnitzel, bratwurst, bircher muesli, a salad buffet) and also a choice of burger, nuggets or spring rolls for veggies. WHAT IS ONE THING YOU NEVER GO TO THE BADI WITHOUT? Little ones love their “badi toys”- we have a big bag suitable for the rocky beach and sandpit- with names etched in permanent marker of course as it’s so hard to keep track when everyone else has the same buckets, diggers and boats! For the older children, their rock shoes, a giant blow up unicorn, their life jackets and the paddle board are always a must. We both moved to Central Switzerland a year ago, and quickly bonded over the challenges and delights of moving country and embracing expat life. By profession we are a journalist and a doctor, and are both on career breaks. 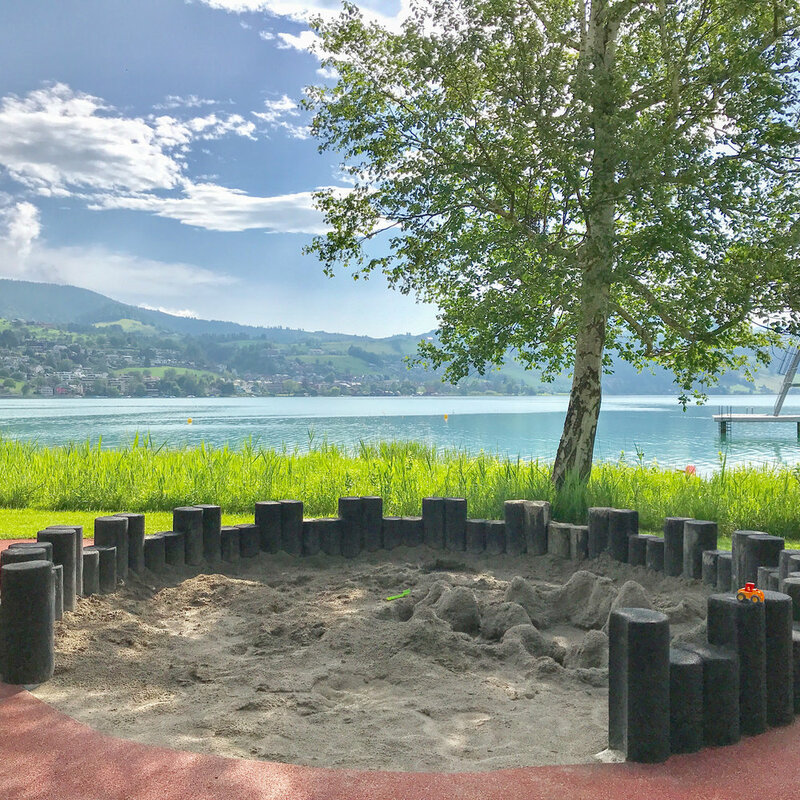 We felt that there was a gap in the market for a website that organised classes and curated activities for families in Zug, so over the last few months have developed Zug Families. We are continually adding new content and keep our homepage and social media accounts updated with what’s going on in the upcoming week so that families don’t have to trawl the internet looking for things to do. So if you would like to know what’s going on in the Zug area, do sign up to updates via our website and follow us on Facebook and Instagram! A big thanks to Sara and Jo for taking us to the Strandbad in Unterägeri. Not just worth a visit in the summer but also in the colder months where you can also escape foggy Zug. 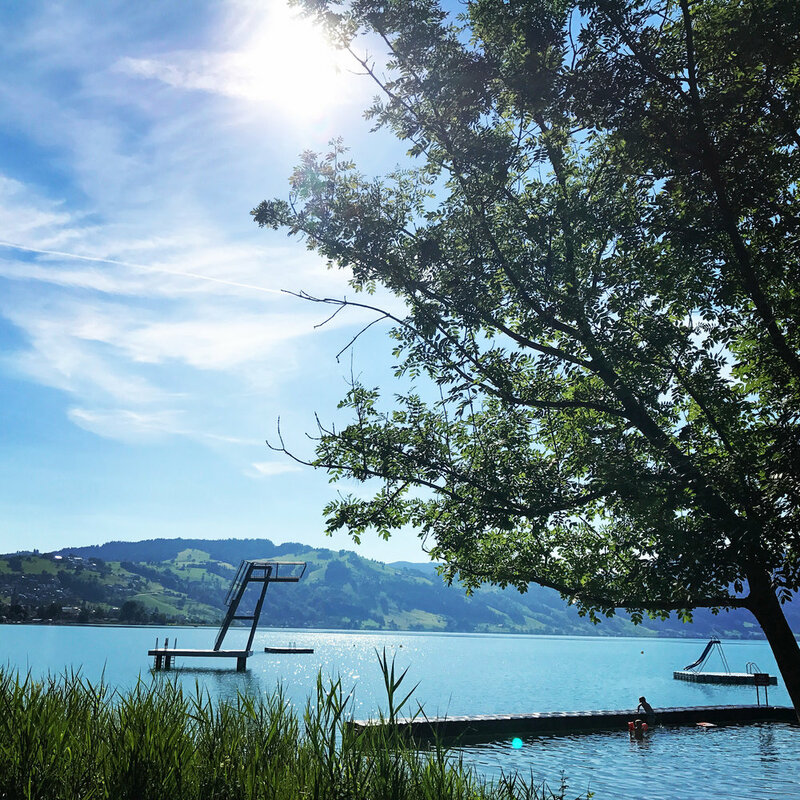 If you have a favourite place to swim in Switzerland and would like to share it with the Simple Family Travel community please get in contact!